Chow mein is popular at Chinese sit-down and take-out restaurants; you may be wondering how well it fits into your diet plan. Chow mein typically includes noodles stir-fried with vegetables, a source of protein and sauce for flavor. The exact nutrition information depends on the specific recipe and the amount you eat; this information may be available online or at the restaurant if you ask for it. Each cup of chow mein noodles provides about 237 calories, 26 grams of total carbohydrates and 4 grams of protein. Each tablespoon of oil added during cooking adds over 100 calories, with no carbohydrates or fat. Vegetables in your chow mein provide a small amount of calories, carbohydrates and proteins. Beef, pork, shrimp and chicken supply about 15 to 25 grams protein per 3-ounce serving. Tofu is also a source of protein. Chow mein noodles have 14 grams of fat per cup, and oils have about 41 grams of fat per tablespoon. Most oils, such as peanut, sesame or canola, are low in saturated fat, which raises levels of cholesterol in your blood and may increase your risk for heart disease. Fatty beef and pork and dark-meat chicken with the skin contribute saturated fat to your meal. Chow mein may contain some trans fats as the result of high temperatures during frying. Trans fats increase your risk for heart disease, and you should minimize your intake. Chinese dishes are often high in sodium because of the monosodium glutamate, a flavor additive, and soy sauce, according to the American Heart Association. Chow mein sauce may be based in soy sauce, which can have more than 1,000 milligrams of sodium per tablespoon. A high-sodium diet can cause high blood pressure; healthy adults should have no more than 2,300 milligrams of sodium per day, according to the 2010 Dietary Guidelines from the U.S. Department of Health and Human Services. To limit amount of sodium in your chow mein ask for a low-sodium version, made with less soy sauce and no MSG. Also, avoid adding extra soy sauce as a condiment once you get your meal. Chow mein noodles are typically refined carbohydrates, not heart-healthy whole grains, and as such, a cup has only 1.8 grams of dietary fiber. 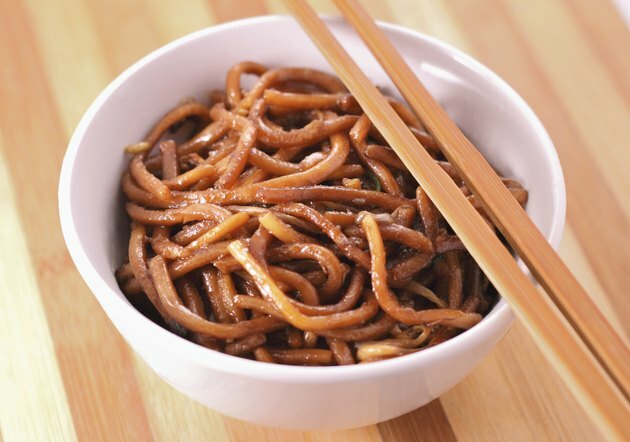 Chow mein is more nutritious when it has more vegetables, which are high in dietary fiber. Fiber helps lowers your cholesterol and may help you control your weight because it is a filling nutrient. Broccoli, onions, peas, carrots and cabbage are high in nutrients such as potassium, vitamin A or vitamin C. Use portion control when you eat chow mein; also remember to count the nutrients from any sides that you may order, such as fried rice. Which Chinese Food Can You Eat When Trying to Lose Weight? Can Eating Stir Fries Help You Lose Weight?